NAAC Peer Team (III Cycle) visited on 04th & 05th August, 2017. Internal Quality Assurance Cell, Smt.A.S.M. 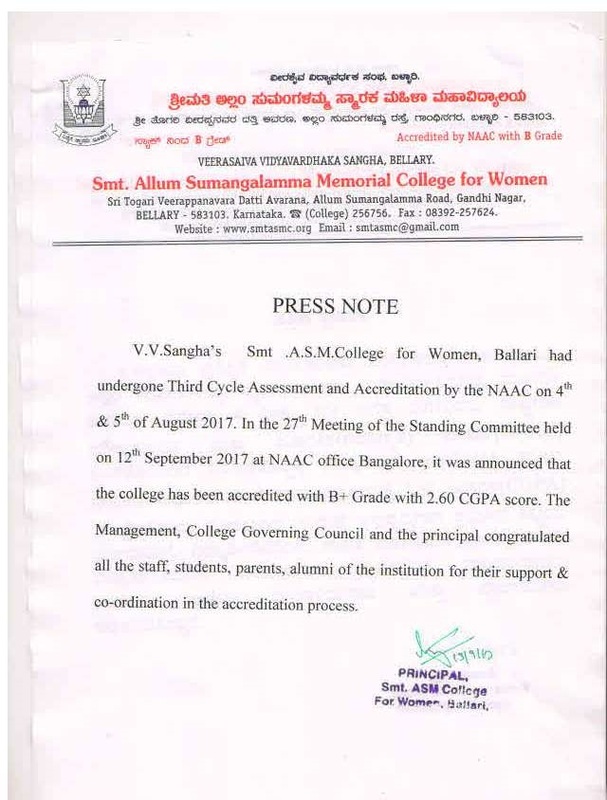 College for Women, Ballari. As a part of requirement of post accreditation quality measure of NAAC, the College established the Internal Quality Assurance Cell (IQAC) on 1st June, 2005. The IQAC being an integral part of the College plays a pivotal role in developing a conscious and consistent system which ensures an overall improvement in the functioning of the College. The IQAC ensures sustenance of quality measures by having transparency and accountability in its functioning and thus assures all the stakeholders viz., students, parents, teachers, staff, management, funding agencies and society about imparting qualitatively proven education. The IQAC is instrumental in organising various activities for the smooth conduct of various courses and programmes. It conveys meeting at regular intervals and provide the directions to undertake activities under different committes, cells, wings of the College. It organises orientation programme for the freshers to acquaint with the College environment. It holds staff meeting and students council meetings along with the Principal to appraise on curricular, co-curricular and extra-curricular activities of the College. It conducts Parent-Teacher Meet and collects the feedback to be used as a base in formulating policies. It documents and compiles the reports on various activities of the College and submit to the concerned authorities regularly i.e., AQAR, AISHE, etc. It helps in updating the infrastructural facilities of the College for smooth conduct of teaching, learning and research activities. The planning, implementation and controlling of all activities of the College is monitored by the IQAC and thereby contribute to the fulfilment of objectives, vision and mission of the institution. Thus, the IQAC strikes a happy medium between the health and growth of the institution. IQAC - Departments, Cells, Committees, Council, Units, Forum, Wing, Centre and Associations. Departments, Cells, Committees, Council, Units, Forum, Wing, Centre and Associations.